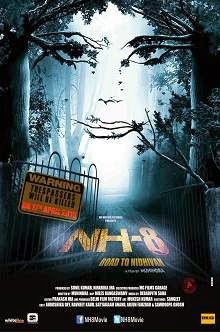 NH-8: Road to Nidhivan is the latest movie I have seen which released 2-3 weeks ago. The greatness about this movie is that I didn't hear about it from any of my friends or closed ones. I didn't even see any update on my Facebook news feed on anyone watching it. This is what it deserves too. I do not know what made me watch this movie which does not have anything potential to show. I do not even know what I am going to write in the review of it as what's to review in a movie that has same thing repeated almost again and again? Nidhivan is a mysterious place. Four friends in their SUV marches out on the journey to find what's mysterious about it. What happens in this journey is what this film is all about. Well, this movie can't be said even NH-10 of the poor. No! It's director, Munindra Gupta, does not even the slightest idea of how a story is converted into a movie through the basic skills a maker should have. And you can blame no one but this man, Munindra Gupta, as he is the director, writer and even the screenplay creator of this movie. Even the actors haven't shown the basic skill set to hold the audience through a very badly made movie. None of the four actors have shown any convincing power. Just writing a tagline "Based on a true story" does not give you license to make anything as stupid as Rahul Gandhi. Yes! The actors keep repeating their dialogues. Each of them has been said for at least 7 times. "Yaar" is heard so many times that you want to kill all your real yaars. It's done just for the sake of making this movie and its base look urban. Instead they should have concentrated on other things to solidify the plot of the movie. The cameras are regularly shaken just to give us a feel of journey but that's the only idea on which, I think, director have planned this whole movie on. There are so many dark scenes that it's unable for you to guess anything what's happening on the screen. At last, when the climax comes and the mystery unfolds, you want even yourself to die in this land of Nidhivan. That's how bad everything goes for this movie. 1/2 stars is what I give to it. And that's because some rating has to be given as NULL doesn't have any value.